Fed Chair Janet Yellen really delivered when she gave her Jackson Hole speech on Friday. But if you missed it, here are the 3 key takeaways from her speech. Also, do note that Yellen’s statement was rather vague in that it didn’t really give a definite date on when the next rate hike will be. The rest of Yellen’s speech was devoted to the Fed’s Monetary Policy Toolkit and largely inconsequential to the market, so you can skip this part if you like. The only real takeaway here is that Fed officials project that they will have to gradually hike rates until 3% and then keep it there in the longer run. Anyhow, if you want a quick summary, Yellen first talked about the pre-2008 debt crisis toolkit, which only included raising or lowering the federal funds rate through open market operations (i.e. rate cuts/hikes). The Fed’s toolkit was later expanded to include the paying of interest on banks’ reserve balances (another means to control the federal funds rate), large-scale asset purchases (i.e. quantitative easing), and “increasingly explicit forward guidance” (e.g. saying that a September rate hike is possible). Looking forward, the Fed will have to gradually hike the federal funds rate, “settling at about 3 percent in the longer run,” as I noted earlier. However, this is significantly lower than the 7% average between 1965 and 2000. The Fed thereby has limited scope for rate cuts if another crisis or recession comes to smack around the U.S. economy. Yellen then stressed that she and the other current FOMC members are “not actively considering these additional tools and policy framework.” I guess she doesn’t want to give the market the impression that the Fed has an easing bias rather than a hiking bias, huh? Anyhow, Yellen continued by saying that the Fed’s monetary policy can only do so much in a severe economic downturn, and that the U.S. government’s fiscal policy also has a large and important role to play. Yellen’s statement that “the case for an increase in the federal funds rate has strengthened” cause the Greenback to spike higher across the board as a knee-jerk reaction. However, it got pulled back down after the initial spike, likely because of Yellen’s caveats or the fact that Yellen didn’t actually give a clear message on when the next rate hike will be. However, the Greenback bulls were persistent and their persistence was ultimately rewarded when the bears got routed after Fed Vice Chairman Stanley Fischer was interviewed by the CNBC shortly after Yellen’s speech. 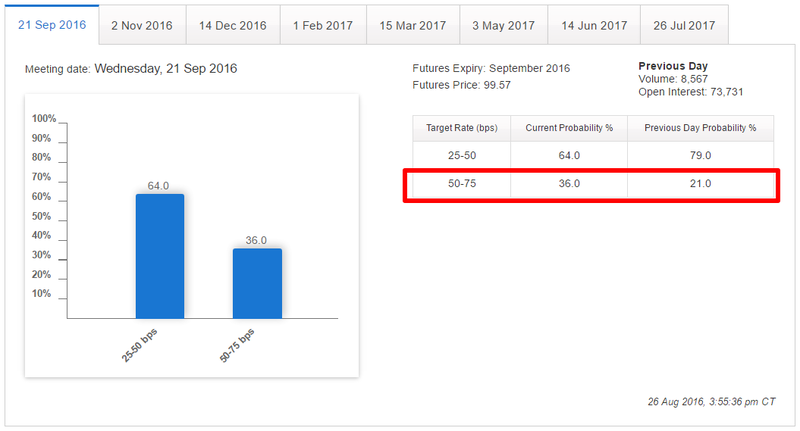 The market apparently took that as a signal that a rate hike is very likely in the cards for the September meeting since the probability of a 25 bps September rate hike jumped from just 21% to 38% before settling down to 36%, according to the CME Group’s FedWatch Tool. Rate hike probabilities also improved for the November and December meeting, although still below the 50% mark for November while just under 60% for December . How about you? After reading up on Yellen’s statements, as well as that of Fischer’s, and having also read up on what and how the other voting FOMC members think, are you convinced that there will be a September rate hike? Share your thoughts in the poll below!